After the Injury: First Aid for Sprains | Podiatry Associates, P.C. The end of February means the beginning of baseball’s spring training season. Our own Colorado Rockies are down in Arizona with the rest of the “Cactus League” teams, gearing up for their first game on March 4. You can bet they are hard at work conditioning themselves—especially their feet—to handle the strain of the game. Even pro athletes can’t prevent some accidental injuries, though, like ankle sprains. You don’t have to be a pro athlete to know what to do when you sprain something, however. Everyone should know basic first aid to deal with those problems when they arise. Ankle sprains happen suddenly and unpredictably. You trip, twist your foot, and end up overstretching the ligaments that support your joint. You’re left with a painful, swollen ankle that may or may not support you. Sprained ankles can develop complications that leave you struggling with joint instability and discomfort for years if the ligaments don’t heal correctly. That’s why first aid is so important—it immediately starts your ankle on the path to recovery and helps protect it from further injuries. First aid for sprains isn’t too difficult. The most effective way to take care of the joint is to follow RICE: rest, ice, compress, and elevate. Rest – Stop all hard-impact activities and minimize any walking or standing. This limits the pressure on the sensitive and vulnerable joint. Ice – Apply ice packs periodically to decrease the swelling and inflammation around the damaged ligaments. 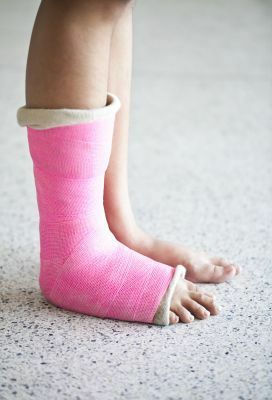 Compress – Wrap the ankle in an elastic compression bandage. This will discourage swelling and help keep the joint stable. Elevate – Prop the ankle up on pillows. This reduces some swelling and helps you rest the foot. If the sprain is serious, first aid can tide you over until you’re able to get additional treatment. Podiatry Associates, P.C. will determine the extent of the problem and treat it so it heals properly. Then when your ankle has mostly recovered, you can begin physical therapy to rehabilitate it. You shouldn’t wait to apply first aid, and you shouldn’t delay in getting additional help for a sprain, either. Contact the Podiatry Associates, P.C. offices in Parker or Castle Pines for an appointment by calling (303) 805-5156. We’ll help you begin your recovery right away.